The founder of the Mafia in the United States was born Salvatore Lucania in Lercara Friddi, Sicily on 11 November 1897. The family arrived in America in 1906 and ten years later, in June 1916, Luciano was sentenced to a year in prison for opium trafficking. 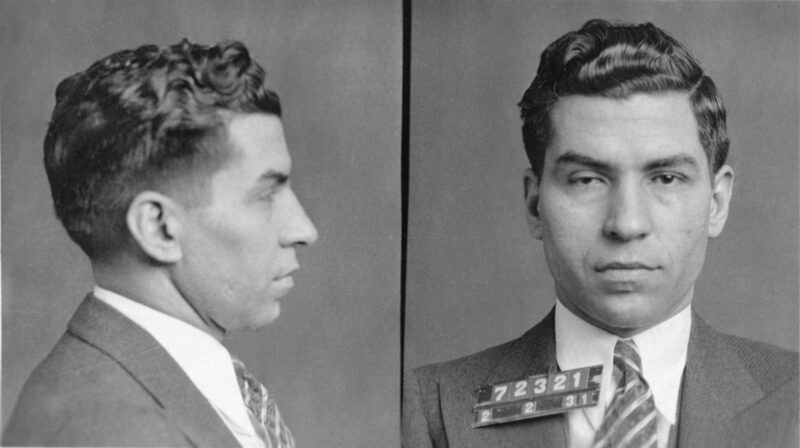 On his release he joined Giuseppe “Joe the Boss” Masseria’s gang. A fight between Masseria’s mob and a rival gang, led by Salvatore Maranzano, resulted in Luciano being stabbed with an ice pick, having his throat cut and being left for dead on Staten Island beach. Miraculously, Luciano survived and was given the nickname “Lucky”. On 15 April 1931 Luciano accompanied Masseria to lunch at Coney Island. He excused himself to visit the bathroom and while he was away Masseria was shot to death by a four-man team — Joe Adonis, Bugsy Siegel (search the article), Albert Anastasia (search the article) and Vito Genovese. Luciano rewarded Anastasia’s loyalty by making him the head of Murder Inc’s enforcement department. Luciano then learned that the Boss of Bosses Salvatore Maranzano wanted him, Al Capone and Genovese dead. Luciano struck first and on 10 September 1931 Maranzano was shot and stabbed to death in his Manhattan office. Luciano divided the city into separate areas, each controlled by a different family but all answerable to him. In 1936 Luciano was sentenced to 30-50 years in prison for extortion and direction of harlotry. During the Second World War, while incarcerated, Luciano helped the authorities although this was denied for political expediency. He was paroled after the war ended but as part of his parole Luciano, who never became a US citizen, was deported to Italy on 10 February 1946 aboard the Liberty Ship Laura Keane. In February 1947 he flew to Havana where he met many old cronies, including Meyer Lansky, Frank Costello (search the article) and Bugsy Siegel. Luciano and Siegel fell out over the latter’s involvement in Las Vegas and Luciano ordered his murder four months later. Luciano’s presence in Havana became known and Cuban dictator Fulgencio Batista deported him to Italy where he was forbidden to leave Naples. Luciano spent his enforced retirement reading newspapers and going on long walks. He began giving interviews to journalists and contemplated writing his autobiography. He once said, “Anything I ever did in my life, I felt justified doing. I never abused anybody in my life. If people abuse me and I abuse them back – that ain’t abuse.” On 26 January 1962 he travelled to Capodichino Airport in Naples to meet a Hollywood producer with a view to a film being made of his life. As he went to greet the producer he suffered a heart attack and died instantly.